EDGI welcomed the opportunity to comment on​ the EPA’s Proposed Rule to repeal the Clean Power Plan (CPP) in April, 2018. 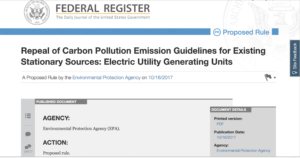 Our comment document, Continued Access to Online EPA Resources Relevant to the Clean Power Plan is Important for Public Engagement in Rulemaking, focuses on removals of online Clean Power Plan resources that constrain the public’s ability to effectively participate in the rulemaking process. Reduced access to related resources, especially the EPA’s climate change websites, also constrains the ability of stakeholders and regulated entities to stay abreast of implementation feasibility and responsibilities under the CPP. Access to these resources should continue to be a priority for effective public participation in relation to the EPA’s ongoing responsibilities for regulating greenhouse gases.